In December 1994, just two weeks after Sister Jodie Mancera delivered her second child via CS, she was operated twice due to infected intestines. But even after her last confinement and surgery, her situation did not improve. She suffered from fevers, intense stomach pains day and night, and couldn’t move out bowel. Within weeks, she was again back to the hospital. From December 1994 to June 1995, she had had four major surgeries. On her fourth surgery, she was diagnosed with colon cancer. Around this time, her beloved husband, Brother Joey Mancera, was already converted and was serving the Lord Jesus Christ faithfully in JESUS MIRACLE CRUSADE INTERNATIONAL MINISTRY. According to Bro. Joey’s testimony, sometime between his bel. wife’s second or third surgery, he was so distraught about their situation – financially, emotionally, and spiritually – that he sank on his knees on the floor and cried out to God. He prayed and asked God where he must go to seek His face. He testifies that after his earnest prayer, he heard a voice – cool and powerful, and sounded like that of waterfalls. The voice told him to worship God in spirit and in truth in Jesus Miracle Crusade International Ministry, that there, he will find the true pastor that will feed him with knowledge and understanding, and where God’s power is manifested. The voice further said that He abhors worship of graven images and idols. Without wasting time, Bro. Joey attended the worship service of JMCIM and received the Lord Jesus Christ as his Lord and Savior and baptism in water in Jesus’ name. Instantly, he received healing of all his diseases – enlargement of the heart, ulcer, and hypertension. He was also completely changed. He forsook his vices such as alcohol and cigarettes. Even before Sis. Jodie’s fourth surgery, Bro. Joey was already trying to share the Gospel to her and the many amazing testimonies of God’s healing in the Church, but Sis. Jodie was hardhearted and instead, openly persecuted the Church. While sick and weak in the hospital after her fourth surgery, Sis. Jodie remained unchanged in her belief and told her bel. husband that she would get well and fully recover because she had complete medicines. It was at this point that Bro. Joey disclosed to her that according to the doctors, she had only four months to live. Sis. Jodie continued to suffer from excruciating pain in her stomach. She spent the nights crying in pain. One night, she dreamed that she went to a church where she saw all the graven images and idols fallen on the floor, she was so terrified she ran and ran. Then she saw a door open and the name of JMCIM written inside with the Jesus Finest Generation Choir singing. Finally, Sis. Jodie surrendered her life to the Lord and after her water baptism, she received complete healing of her disease. This was 16 years ago, and she and her bel. husband continue to serve the Lord faithfully to this day. Bro. Joey became a preacher of the Church. Sis. Marife Doldolea in her Adults Choir Wednesday uniform in Amoranto Stadium. (Photo taken in 2010). In the early 1990s, Sis. Marife Doldolea was a pastor in another church. But though she preached healing, she herself wasn’t healed of her leukemia. Every week, she had to undergo blood transfusion. But later on, her body rejected it, for she would urinate blood after transfusion. To add to her suffering, around 1994, Sis. Marife was diagnosed with colon cancer. She underwent surgery three times to remove diseased portions of her intestines. She called it “cut-and-connect” operation. But despite the surgeries, her intestines were inflammed, her stomach was bloated, and her wound refused to heal. She didn’t undergo chemotherapy. Sis. Marife became bed-ridden. The pain from her bloated stomach was too much for her to bear that she would request a new blade and open up her wound herself to let out the puss. But Sis. Marife obeyed the voice and went anyway. Lying on a cot, she was brought to the crusade of JMCIM at the Quirino Grandstand, Luneta Park, Manila. When the Jesus Finest Generation Choir sang “The Lord’s Prayer”, she did her best to raise both hands and with eyes tightly closed, she joined in singing. She felt two big hands held her upraised hands. Then she felt that she was slowly raised from her cot, so she opened her eyes and looked, but only saw the people praising and worshiping. Again, she closed her eyes and continued to sing, and again, she felt herself being raised from her bed. She could feel that she was really floating and she felt good. When she dared open her eyes again, she only saw clouds! After the singing of the Finest Choir, Sis. Marife was relieved of her pains and her bloated stomach returned to normal. That night, she received Jesus Christ as her Lord and Savior. She wasn’t baptized in water yet for her wound was still very fresh. Later on after Sis. Marife was baptized in water in Jesus’ name, she instantly received complete healing of her colon cancer and leukemia. She surrendered her life fully to the Lord and has been serving Him faithfully to this day. 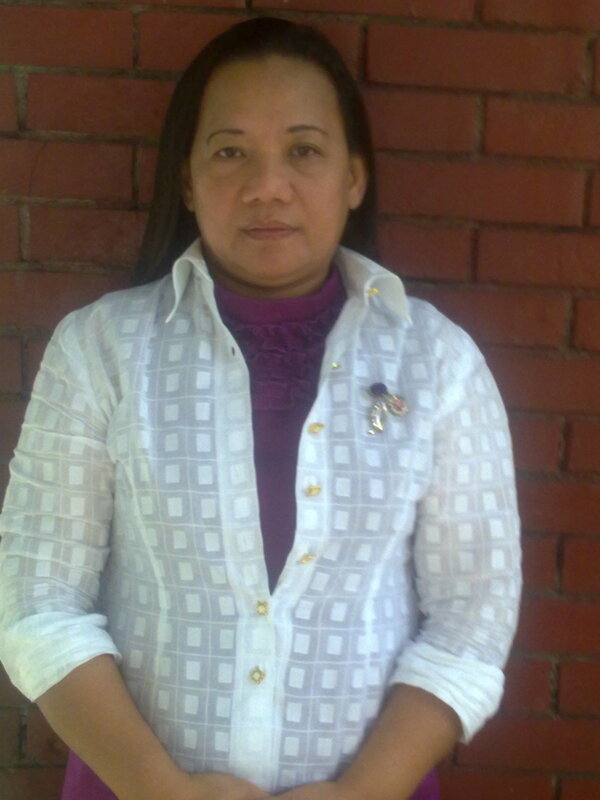 She sings in the Adults Choir and ministers in Bible Study groups and in JMCIM jail ministry.